A motorcycle (also called a motorbike, bike, or cycle) is a single-track, engine-powered, two-wheeled motor vehicle. Motorcycles vary considerably depending on the task for which they are designed, such as long distance travel, navigating congested, cruising, sport and racing, or off-road conditions. Motorcycles are one of the most affordable forms of motorized transport in many parts of the world and, for most of the world’s population; they are also the most common type of motor vehicle. There are around 200 million motorcycles (including mopeds, motor scooters and other powered two and three-wheelers) in use worldwide, or about 33 motorcycles per 1000 people. This compares to around 590 million cars, or about 91 per 1000 people. Most of the motorcycles, 58%, are in the developing countries of Asia—Southern and Eastern Asia, and the Asia Pacific countries, excluding Japan—while 33% of the cars (195 million) are concentrated in the United States and Japan. As of 2002, India with an estimated 37 million motorcycles/mopeds was home to the largest number of motorized two wheelers in the world. China came a close second with 34 million motorcycles/mopeds. A solenoid valve is an electromechanical valve for use with liquid or gas. The valve is controlled by an electric current through a solenoid: in the case of a two-port valve the flow is switched on or off; in the case of a three-port valve, the outflow is switched between the two outlet ports. Multiple solenoid valves can be placed together on a manifold. It is a lead- battery. The bayberry is consider as the most important component of the MINIATURE MODEL OF SOLAR CAR . The battery has a 12V capacity. The battery is rested on the frame. In isolated systems away from the grid, batteries are used for storage of excess solar energy converted into electrical energy. The only exceptions are isolated sunshine load such as irrigation pumps or drinking water supplies for storage. In fact for small units with output less than one kilowatt. Batteries seem to be the only technically and economically available storage means. Since both the photo-voltaic system and batteries are high in capital costs. 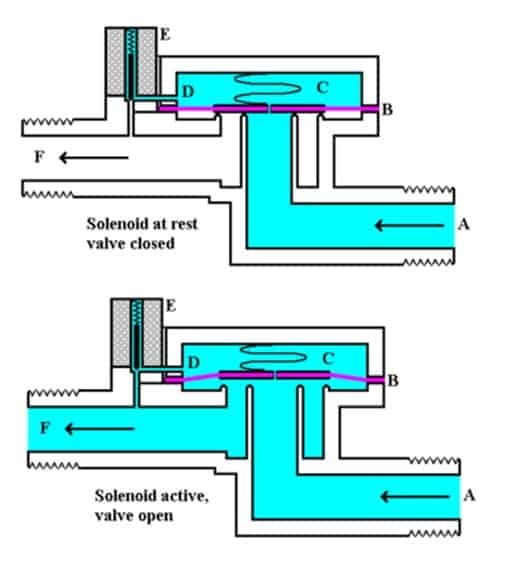 A solenoid valve has two main parts: the solenoid and the valve. The solenoid converts electrical energy into mechanical energy which, in turn, opens or closes the valve mechanically. A direct acting valve has only a small flow circuit, shown within section E of this diagram (this section is mentioned below as a pilot valve). This diaphragm piloted valve multiplies this small flow by using it to control the flow through a much larger orifice. Solenoid valves may use metal seals or rubber seals, and may also have electrical interfaces to allow for easy control. A spring may be used to hold the valve opened or closed while the valve is not activated. The diagram to the right shows the design of a basic valve. At the top figure is the valve in its closed state. The water under pressure enters at A. B is an elastic diaphragm and above it is a weak spring pushing it down. The function of this spring is irrelevant for now as the valve would stay closed even without it. The diaphragm has a pinhole through its center which allows a very small amount of water to flow through it. This water fills the cavity C on the other side of the diaphragm so that pressure is equal on both sides of the diaphragm. While the pressure is the same on both sides of the diaphragm, the force is greater on the upper side which forces the valve shut against the incoming pressure. In the figure, the surface being acted upon is greater on the upper side which results in greater force. On the upper side the pressure is acting on the entire surface of the diaphragm while on the lower side it is only acting on the incoming pipe. These results in the valve being securely shut to any flow and, the greater the input pressure, the greater the shutting force will be. In the previous configuration the small conduit D was blocked by a pin which is the armature of the solenoid E and which is pushed down by a spring. If the solenoid is activated by drawing the pin upwards via magnetic force from the solenoid current, the water in chamber C will flow through this conduit D to the output side of the valve. The pressure in chamber C will drop and the incoming pressure will lift the diaphragm thus opening the main valve. Water now flows directly from A to F.
When the solenoid is again deactivated and the conduit D is closed again, the spring needs very little force to push the diaphragm down again and the main valve closes. In practice there is often no separate spring, the elastomeric diaphragm is molded so that it functions as its own spring, preferring to be in the closed shape. From this explanation it can be seen that this type of valve relies on a differential of pressure between input and output as the pressure at the input must always be greater than the pressure at the output for it to work. Should the pressure at the output, for any reason, rise above that of the input then the valve would open regardless of the state of the solenoid and pilot valve. In some solenoid valves the solenoid acts directly on the main valve. Others use a small, complete solenoid valve, known as a pilot, to actuate a larger valve. While the second type is actually a solenoid valve combined with a pneumatically actuated valve, they are sold and packaged as a single unit referred to as a solenoid valve. Piloted valves require much less power to control, but they are noticeably slower. Piloted solenoids usually need full power at all times to open and stay open, where a direct acting solenoid may only need full power for a short period of time to open it, and only low power to hold it. Thus the fuel flow is also controlled by the same method. Applied in all automobile vehicles.